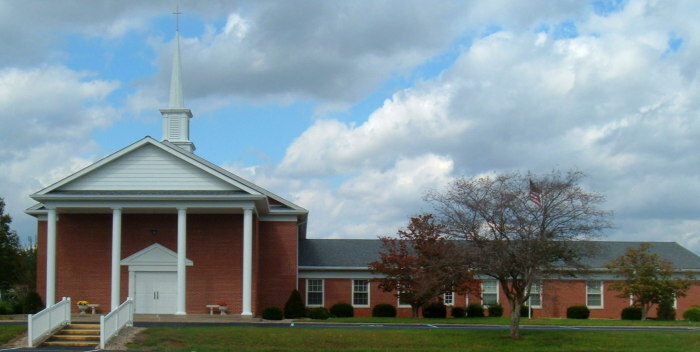 Interested in learning more about the Paoli United Methodist Church? 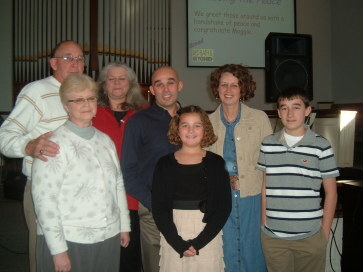 Are you interested in learning more about the Paoli United Methodist Church? We invite you to visit us for a worship service. Maybe you don't have any idea about what faith is, what the Bible is and what it can tell you, or how God can help you through difficult times. We're here to help! Maybe you don't have a church home and you are looking for one. We would love to include you in ours! We invite you to consider membership in our church. Maybe you don't belong to any church yet. Or, maybe you want to transfer your membership from another church, either another United Methodist church or a church of another denomination. Whatever your situation, you are welcome here! Please call the church office at +1-812-723-2965 and speak with the pastor. The first step is to meet with our pastor to learn about the benefits of membership in our church family. Pastor Val is teaching an adult confirmation class on Sunday mornings from 9 to 10 AM. If you would like to learn about our faith and church, you are invited to attend. The next step is to take part in an education program in which you learn about Christianity, the United Methodist Church at large, and our local church. These three youth are going through membership training before becoming full members of our church. Pastor Val is standing at center. On either side are adult mentors, Junior McBride and DeeAnn Harmon, who work with the prospective members throughout their training. 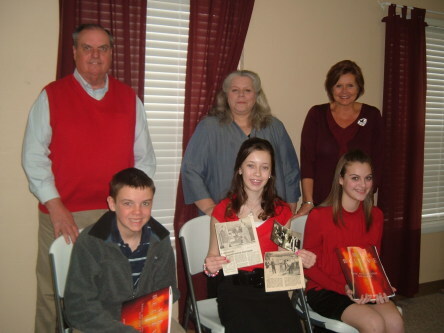 Here is another group of youth as they have finished their membership training and join the church. 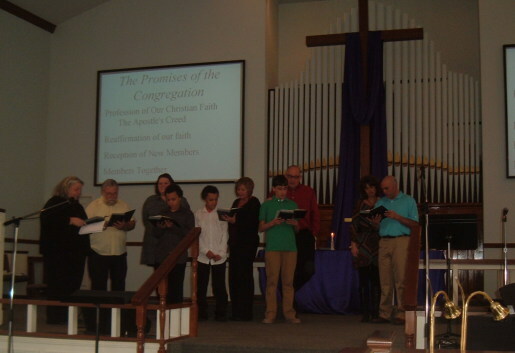 Their mentors Alan-Foughty-Killion, DeeAnn Harmon, and Darrell Newkirk, along with the pastor and other adult members lead them through the reading of the membership pledge. 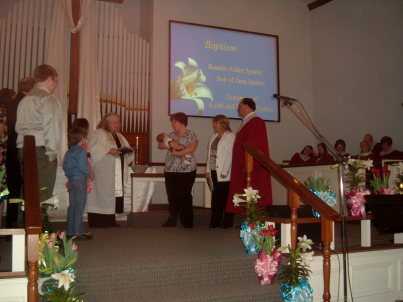 Youth who were baptized as infants have the opportunity to publicly confirm the vows made on their behalf. This young girl has just had her baptism confirmed by the pastor and is standing here with her brother, parents and grandparents. 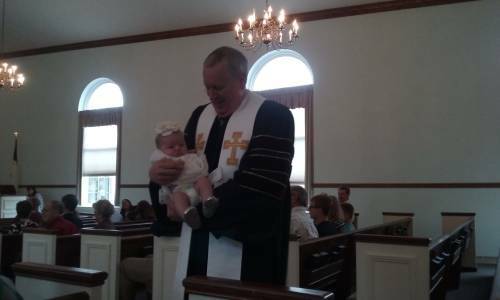 Holy Baptism is a Covenant between an individual and God. It is God's word to us, proclaiming our adoption by grace and our word to God, promising our response of faith and love. We welcome your inquiry about the Sacrament of Baptism and we look forward to assisting your family with planning this special day. 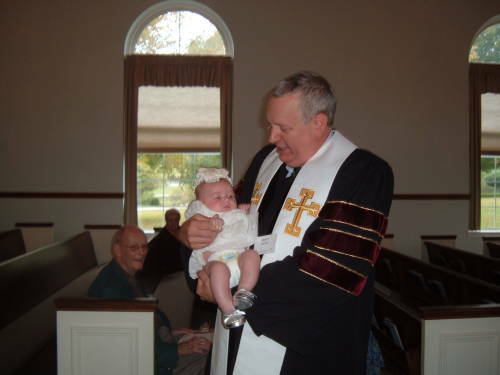 It is our desire to make your baptism a most memorable occasion. 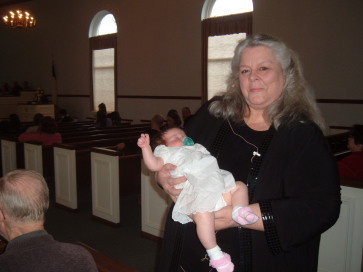 Persons of all ages can be baptized at the Paoli United Methodist Church. Non-members are encouraged to seek membership as soon as possible after being baptized. We baptize by sprinkling Holy Water and make the sign of the cross on the forehead with anointing oil to invite the presence of the Holy Spirit. The United Methodist Church recognizes baptisms from other faiths and churches and therefore does not require you to be "re-baptized". Read more about the beliefs and values of the United Methodist Church.